HTML5 web application with source code. PHP backend. Supports MySQL and SQLite. It will display an empty Scheduler with the default scale and no resources (rooms) defined. We will work with days as the basic time unit for hotel reservations. 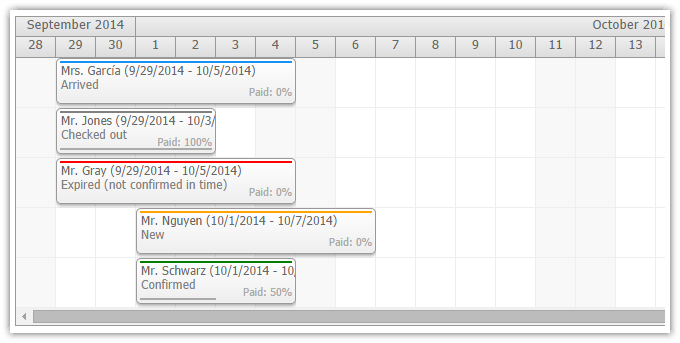 We switch the Scheduler scale to "Days" and display months and days in the time header rows. We want to display additional room information (capacity, status) in additional row header columns. The columns can be defined using rowHeaderColumns property. There is a special rendering event (onBeforeResHeaderRender) that will let us customize the row headers. We will create a new event handler to map the room data to columns. Now we want to load the reservations (events) from MySQL database. Again, we will use a simple jQuery AJAX call. The PHP backend endpoint filters the reservations using the start and end query string parameters. 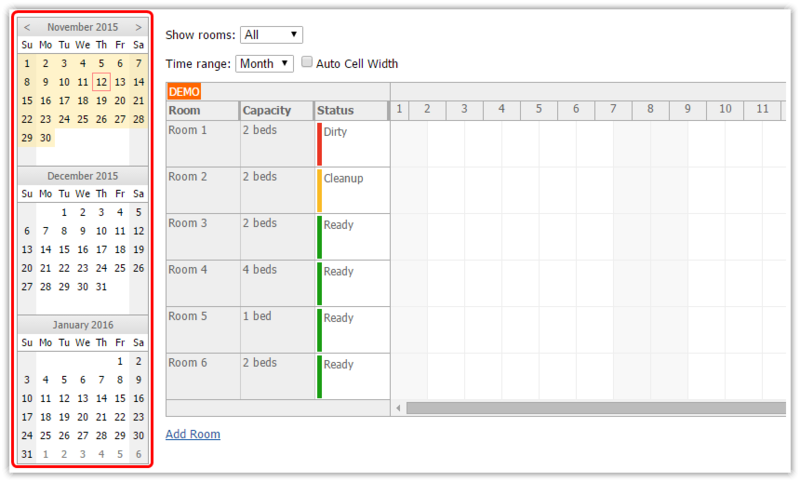 Our room booking application will support filtering the hotel rooms by capacity. We can implement the room filter using a simple drop-down list. The filtering logic is implemented on the server side, in the backend_rooms.php script. We need to extend loadResources() method and backend_rooms.php to support the room capacity filter. The selected filter value is added to the request URL as capacity query string parameter. 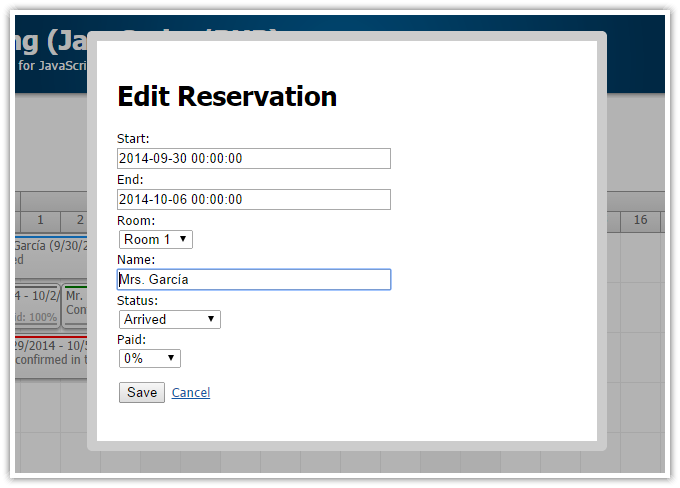 The end users should be able to create a new room reservation using drag and drop. Drag and drop time range selecting is already enabled, we just need to add the event handler. The event handler opens a new page (new.php) in a modal dialog using DayPilot.Modal class. This page contains a simple HTML form. We need to close the modal dialog on the submission so we intercept it using jQuery. We will submit it using a special AJAX call ($.post) and close the modal dialog using parent.DayPilot.ModalStatic.close(). The backend_create.php is the AJAX endpoint for creating a new reservation in the database. In order to let the users edit the reservation details we create a new event click handler that will open a modal dialog with reservation details. The modal dialog logic is the same as in the case of creating new reservations. We intercept the form submission and save the data using a special AJAX call to backend_update.php. The reservations can be moved using drag and drop. Whenever the reservation is dropped at a new location, onEventMoved handler is fired. We will call backend_move.php using AJAX to save the new reservation date. As we don't want to allow overlapping reservations (double booking of a room) we turn off event overlapping. This will prevent moving or resizing a reservation over existing reservations and selecting a date that is already booked. The reservations can be deleted using an icon in the upper-right event box. We need to enabled this feature using eventDeleteHandling property and add an onEventDeleted handler. The event handler will call backend_delete.php using AJAX. 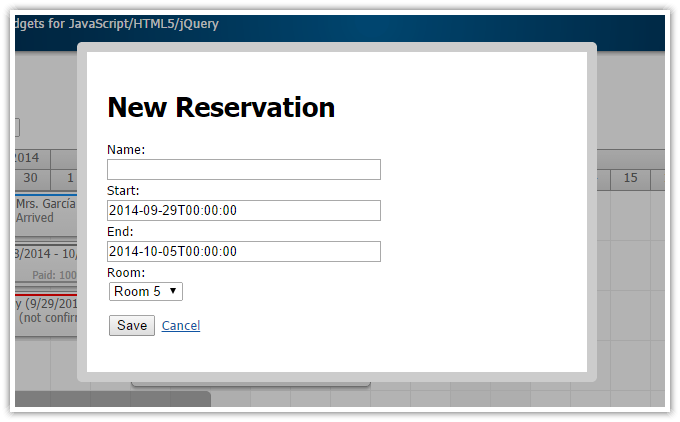 The reservation box appearance can be customized using onBeforeEventRender event handler. We will use it to set custom duration bar color and text, depending on the reservation status. 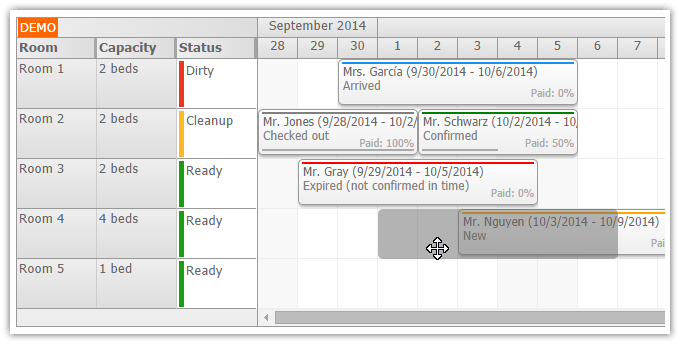 We will let the users change the visible date by selecting it using a Navigator control. 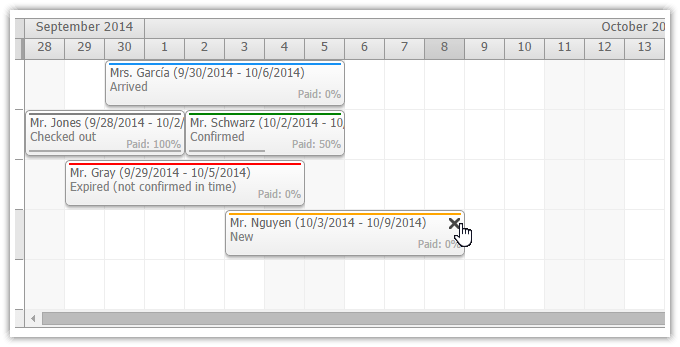 We will also let them change the visible date range using a drop-down list. 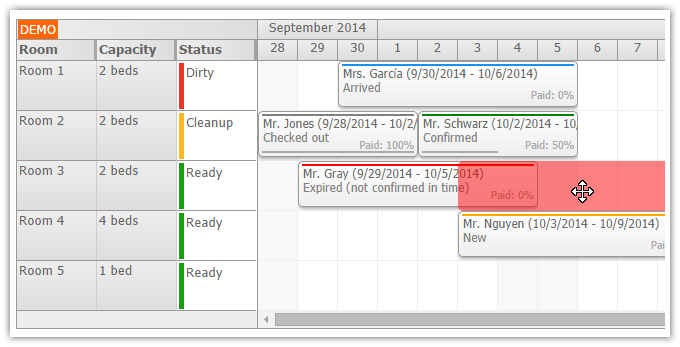 Normally, the Scheduler generates the timeline automatically from .startDate and .days properties. The day cells in the standard timeline always start at 00:00 and end and 24:00. 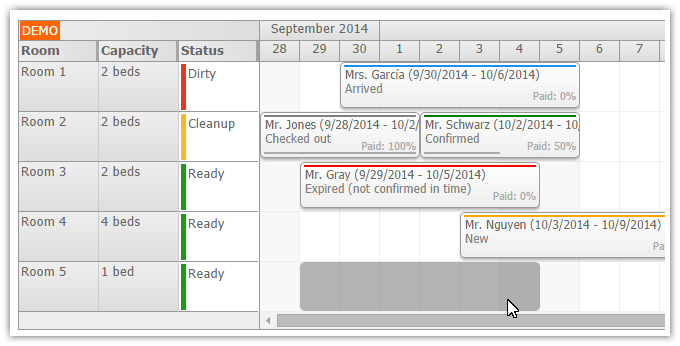 Hotel reservation systems work with overnight cells with custom check-in and check-out time. 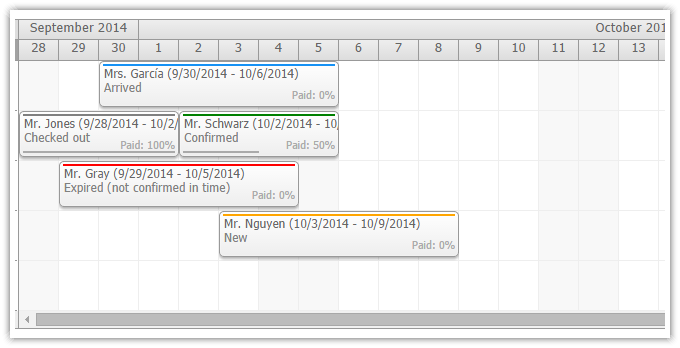 We will create the Scheduler timeline manually and set custom cell start and end. The check-in and the check-out times are set to 12:00 (noon). Don't forget to adjust the database connection properties (server, database name, username, password, port) in _db_mysql.php. The MySQL script will create 'rooms' and 'reservations' tables in the target database (if they don't exist already). January 26, 2017: DayPilot Pro version updated (8.2.2661). June 8, 2016: onBeforeEventRender fixed (missing "now" declaration). Updated with the latest DayPilot Pro version (8.2.2200). December 8, 2015: MySQL DB schema fixed (auto incrementing room id). November 16, 2015: DayPilot bug fixed (moving existing events over today). November 12, 2015: Navigator added, room creating and editing. October 1, 2015: Incorrect start and end dates in loadEvents() fixed.